People are people, right? Actually, not so much. Social business marketing — and, well, marketing and communications in general, really — starts with people. As in, who are you trying to reach? What do you know about them? What do they want to do? What do you want them to do/believe/understand/buy? Since the point of departure is understanding selected groups of people, we often start our marketing and communications plans with some kind of description of the people we’d like to engage. And recently, there’s been a lot of discussion in my world about three different ways of describing people — audiences, constituencies and personas. I’d like to offer my understanding of these three terms and see what others think. Again, this is all in the context of marketing and communications, but I’d be interested as well to know if other disciplines or industries have attached other meanings to these words (or words like them). Audience: An audience is a group of people who may have nothing in common with one another other than the fact that they are all consuming the same piece of content. I like to think of this as a fairly passive grouping of people since they may not know each other or want to know each other at all. Just like when you see a movie — thousands of other people may see the same movie (some of them may even be in the same room with you) but you may have little in common with them beyond some demographic similarities. These similarities can be, however, very powerful for the marketer — the simple fact that you are sitting in front of that particular piece of content can say a lot about you, for example some of your interests, your approximate income level, the language you speak and the region you live in etc. Constituency: A constituency is an activated group of people with shared ambitions, objectives and/or pain points – they self-identify with a cause or a shared belief and seek change. While they may have certain demographic similarities among them, these similarities are not a constituency’s defining characteristic. Instead, it is a psychographic profile that unites a constituency. The term constituency is, of course, borrowed from democratic representative politics where elected representatives go to congress or parliament to represent the needs and desires of the people back home who share a common need to see certain things about their lives changed through legislation. In the world of increasingly personalized and intimate marketing and communications, it can be incredibly powerful to understand which constituencies will most likely affect your organization. 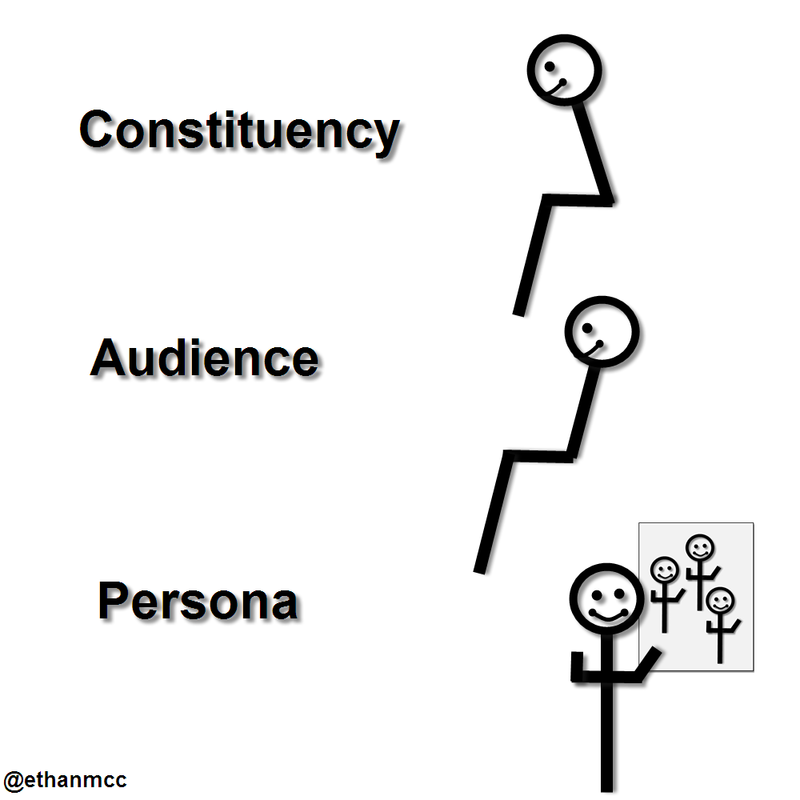 I find it helpful to think of audiences as leaning back & receiving compared to constituencies leaning forward & acting. So, as you can see, I don’t view these three terms as mutually exclusive or in competition. They are just three different ways to think about groups of people when doing your marketing and communications planning. I’d be interested to hear if you have other ways of thinking about groups of people or if there are nuances here that could be better unpacked or described. An example would be the ‘Photography Community’. This community is bound by the same interest ie photography, has strong propensity to explore latest camera models and imaging software and a subset of this community is constantly moving up the photography value-chain – from amateur to prosumer to professional. For a camera company like Canon or Nikon, this entire community is of great interest, but for a company like Adobe it is specific slices of this community where the real value of social business really lies. Thanks — yeah, Goldie, “community” is a good one. I tend to think that constituencies often form and join communities as a mechanism for advocating change. Another one that came up in a conversation today is “market segment” — but I think the word “audience” can cover that as well. – A Constituency is an activated group of people who share a common psychographic (a higher level set of examples might be: Interest, Ambition, Belief). They self-identify with a cause or a shared belief and seek change. – A Persona is a fictional profile. Each profile is developed to represent a group of web users / stakeholders (and is likely to include a combination of fictional psychographics and demographics). The next step in my mind is to define WHEN to use each type of grouping. If the aim is to target people via TRADITIONAL outbound paid media, we would probably need to define an audience (with demographics). This would result in REACH. If you’re looking for a METHOD to ensure all major stakeholders / users / types of customer are catered for in a new digital product design (website, application etc), then personas would be the grouping to develop and use. I’m interested to hear whether others agree/disagree. Are there other ways of thinking about groups of people, or other nuances? A couple of comments: Rowan, I really like the connection you made between “traditional outbound – audience – reach” in one way and “listen – constituency – engage” in the other. I just think that in a real life example they would happen the other way around: first you decide if you want reach or engage (or both) with your target, then you group them – either as a constituency or an audience – and lastly you choose the appropriate marketing technique to apply (outbound or listen/inbound). Does it make sense? Hi Tiago, that’s a great clarification – I agree the objective would come first. Then the plan could be built including defining the type of group and the objective for the relationship with that group, then the step of research / listening (if possible) and defining content/messages, tactics and the most appropriate measurements, Have you seen the ‘Integrated Digital Plan’ chart? http://rowan.typepad.com/watts_up/2011/11/the-integrated-digital-plan.html I would love to hear any feedback you have on that too! Great ideas, and a good opportunity for me to look at the obverse side of a coin. I’ve been espousing to IBMers ( http://ow.ly/90IKe ) the importance of clearly defining and differentiating their digital personas, the online faces they present to friends vs family vs professionals. Though I think, in time, we’ll see persona gradation and blending as technology catches up to support the spectrum of faces we present, for now people present themselves with a set of narrowly defined hats: their personas (we’ll get to personae). That’s the side of the coin I’ve been focused on, but you bring up the other: what of the personae we market to? The ones we target User Experiences to? If technology is enabling people to manage facets of their self separately, we should also be able to identify each of those facets, rather than the whole individual. Perhaps they’ll even provide it: “This is my professional profile” (on LinkedIn). That allows us to understand the types of personae that are in an audience, to find correlations between them because we’re looking at real people rather than mannequins. They have fuller, richer digital behavior than we can invent. The cool thing about it is that people are putting themselves out there, they want to be seen and they want us to know what they represent and what they care about. We can learn a lot from them, and we have real people we can approach to test our theories. a colleague once told me, as a compliment, that I’m able to turn complex concepts into simple concepts. More than a compliment, though, I take that as a personal limitation: since I have a hard time understanding complex concepts, I need to break them down into easier ideas to really understand it. 1. it’s a great piece of work! I can’t think of any missing element here!! 2. you wrote that “content”, “media”, “metrics” and “analytics” are the core pillars of digital M&C… so why aren’t they represented as pillars in the model? 2b. I tend to see “social engagement”, “search”, “mobile”, etc as a deeper level of detail of the “media” pillar, so I’d exclude them from here to make things simpler. 3. you have two big converging arrows (“engagement plan” on the right and “inputs/objectives/constituents” on the left), right? I don’t get exactly where they are converging to, which is the element that puts them together? I think the right arrow should point to the “objectives”, which are the ultimate goal of the digital plan. 3a. it’s hard for me to see “inputs/objectives/constituents” grouped together since “objectives” are exclusively internal to the company and “constituents/inputs” can be internal and/or external. 4. I see “listening” and “measurement” but I don’t see the real action, the implementation of the activity. And I also have a hard time understanding why the “content” pillar is included in the “listening” activity (shouldn’t it be independent of content?) I actually see “listening”, “implementation” and “measurement” not as elements of the model itself but as activities that grab from the model only the pillars they need. I assumed that in planning a digital activity you first need to listen, then act and then measure. Once you have started, these activities can happen at the same time but for the purpose of this analysis I considered them separately. Hi Tiago, thanks very much for taking the time to think about the Integrated Digital Plan and provide your feedback! I can’t seem to access the Prezi link, but would very much like to talk through your perceptions of the model and your ideas, as input into how to improve it. Many of your questions arise from elements requiring explanation. There may be better ways to represent these things, so it doesn’t need so much explanation. I’ll be in touch to see if we can find a time to discuss. Thanks again! Rowan, more than happy to discuss about it! Going back to Ethan’s topic of groups, I have been contemplating whether to define ‘stakeholders’ as a separate group. It is another term that seems to regularly come up. Do you think ‘Stakeholders’ should be a separate group, in addition to: ‘Audience’, ‘Constituency’ and ‘Persona’?